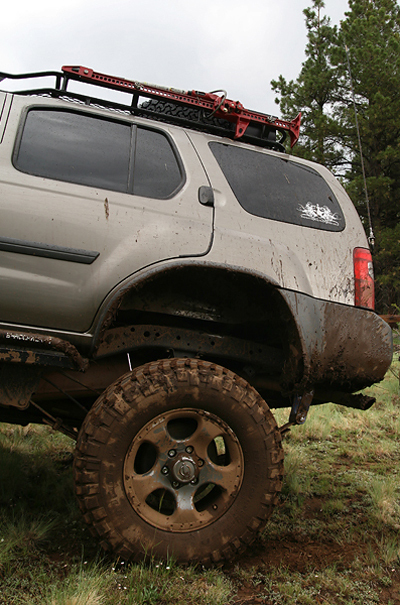 There's not a lot of info on adding spacers on a Nissan Xterra- well besides don't do it. 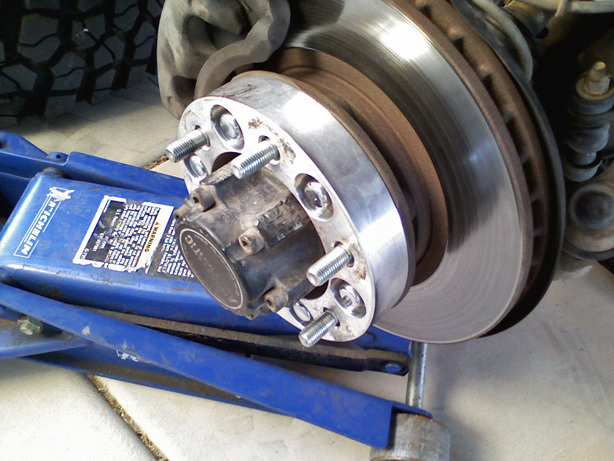 As long as quality spacers are locked down though, the added exterior angle stress added on IFS suspension components is no more than using a smaller "correctly" backspaced wheel. My X is sporting the supercharger package rims. Even with 3 inches of suspension lift and a 2 inch body lift, 285/70/17 (33x11.50) is the tire size I'm stuck with unless I keep it on road. I had always wanted the tires to be pushed out a hair to increase the looks and stance. When I got the new BFG KM2's, I went ahead and threw on a set of spacers from RuggedRocksOffroad.com as well. I ordered the 1" but they were out so I tried the 1.25" and they ended up working out just fine. For safety's sake, I used red loctite since I didn't plan on taking them off anytime soon. The threading happened to be different on the spacer studs compared to the wheel studs, so I had to use the lugs inside the spacer. Thought shiny, they still fit just right, allowing the spacer to sit flush and not enough room to work themselves out if the loctite should fail. While the spacers looked fat before putting the wheel back on, after everything was buttoned up, the subtle look was just enough to look proportionally correct on the X. 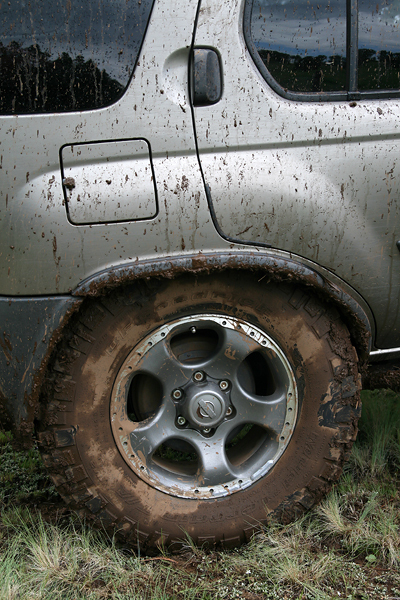 The most important part was that the wheels still stuffed just fine without any fender damage. Last edited by Skatchkins; 07-24-2010 at 05:23 PM. looks good. i run spacers in the rear on mine and have had zero issues even doing the desert stuff. the biggest issue with spacers is after you initially put them on you need to go back and retorque them at least 2X after about 25-50miles each. by then everything had seated and your good. most spacers fail because they werent tight. looks good with the km2 though. most spacers fail because they werent tight. Looks great Mike. Welcome to the spacer club. Great write up. That looks mean! any pics of it from the front so we can see the stance? Oh you mean the Xterra. LOL I did mean the xterra. ... although I did notice the flexed bulging bicep. very intimidating.